A close friend of mine took ill this winter, and it shook my world. She is fine now, on the mend, facing choices about her health and future. We are confident she will be well. While this is a relief, I am struck by how her illness upset me in unexpected ways. Perhaps because I grew up with two sisters, I find that my friendships with women form a core to my life that keeps me grounded in ways that are different from my relationships with men. Don’t get me wrong: I wouldn’t be me without my husband’s love, son’s attention and caring guy friends. But there is something different about how women relate and take care of one another that I treasure, love and count on in the same way I expect that sun to rise every morning. Remember the song “Sisters” in White Christmas? I hear it in my mind when I think of my own sisters. When we were little we would sing it to each other. We planned to always be there for each other in rich and close ways throughout our lives, but sadly it didn’t work out that way. We changed, and our lives took different courses before they each died relatively young. While I know they can never replaced, I do know that the intimacy I am capable of with my women friends is a direct result of having had sisters when I was young. This is a strength I will always treasure. 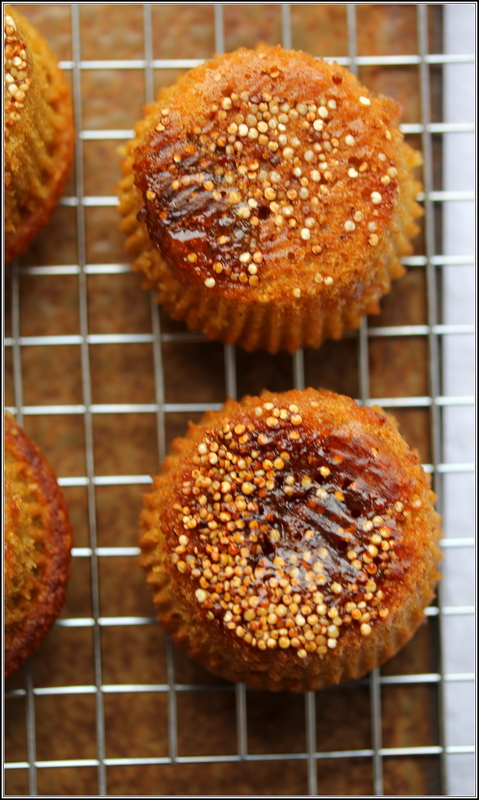 I made these Quinoa and Plum Mini-Cakes for my friend to help her through her illness. They are both dairy and gluten-free. For some that might be welcome news but it might scare others into concerns that they will taste like cardboard. Trust me: they are light and delicious. 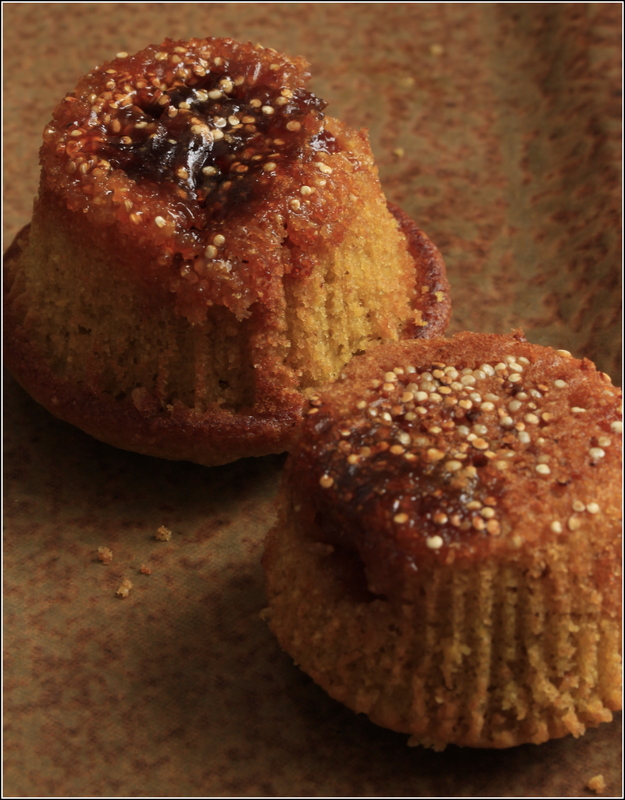 Quinoa gives them crunch, plum jam and demerara sugar sweetness, and olive oil both moisture and a fruity flavor. I’ve written the recipe for a double batch because they will be eaten quickly. Enjoy! P.S. Watch for my next post in about 2 weeks. 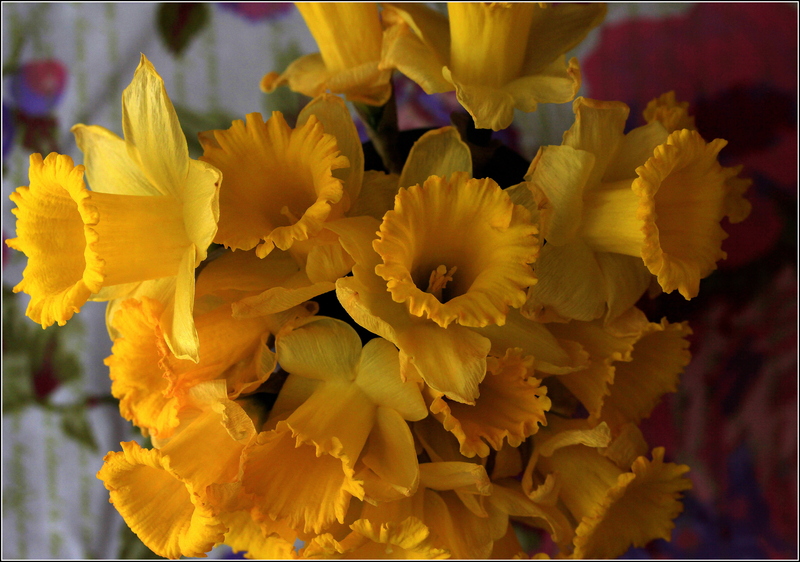 Until then, think spring and daffodils! Line the muffin tin with cupcake liners. Drizzle a bit of olive oil in each. Using a pastry brush, spread the oil evenly on the liners. Pour a sprinkling of quinoa into each. In an electric mixer or using a spoon in a large mixing bowl, blend the eggs and the olive oil until fully combined and very thick. Add the soy milk, vanilla and demerara sugar. Mix to blend. Sift in the remaining dry ingredients. Fold in lightly, mixing just enough to combine. Place the cupcake pans into the oven. Bake for 25 to 30 minutes or until the cakes are golden and firm to the touch. Before serving, remove the cupcake liners from the cakes. Place, inverted, a serving platter. You can substitute any fruit jam for the plum jam to create a different type of cake. Raspberry jam works well. Demerara sugar, otherwise known as turbinado, is raw, unprocessed sugar. It looks like brown sugar. Serve for breakfast with fruit and coffee. For dessert, serve with frozen yogurt and fresh fruit. 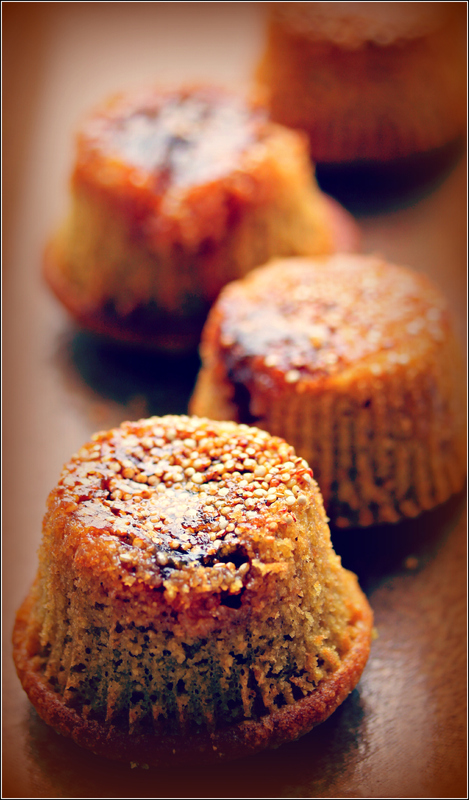 This recipe was adapted from Le Pain Quotidien Cookbookby Alain Coumont and Jean-Pierre Gabriel.